Welcome to the Friends of Alzey Website. If you have an interest in Germany, we have a number of events to suit you. Throughout the year, we have a mixture of social and fundraising activities. We also hold monthly conversation evenings to give German speakers of all abilities the chance to practise the language. At the heart of the town twinning is a bi-annual trip to Alzey. We also welcome our German friends to Harpenden every second year. These trips offer interesting activities as well as excellent opportunities to build personal links between our twin towns. Alzey is a picturesque town located in the heart of Germany's main wine-growing area in the Rhineland-Palatinate region south of Frankfurt. It has a population of 18,500. The town has a long and eventful history going back to Roman days. It was burned to the ground by French troops in 1689 and incorporated into France in 1798 before becoming part of the Grand Duchy of Hessen in 1816. In 1947 Alzey was included in the newly formed federal region of West Germany, Rheinland-Pfalz. The town's emblem captures its historical links as part of the so-called Kurpfalz territory in the Holy Roman Empire (shown by the image of a lion) as well as its place in Germany's most famous legend from the Middle Ages, the Nibelungenlied (shown by the image of a fiddle). Wine growing is the dominant industry in Alzey, making it the sixth largest wine producer in the Rheinland-Pfalz region. The friendship between Harpenden and Alzey is a long established one. The first twinning events go back a long way with	Harpenden and Alzey having been twinned since 1963. The Friends of Alzey and their equivalent in Alzey, the Friends of Harpenden, were created in 1979 to deepen personal links between the two communities. The towns enjoy a number of active links through contacts between the respective town councils, schools, sports clubs and other organisations. Harpenden is Alzey's oldest twin town. It has also has twinning arrangements with a number of other towns, including Josselin in France (since 1973), Rechnitz in Austria (since 1981), Koscian in Poland (since 1990) and Kamenz in Saxony, Germany (since 1990). 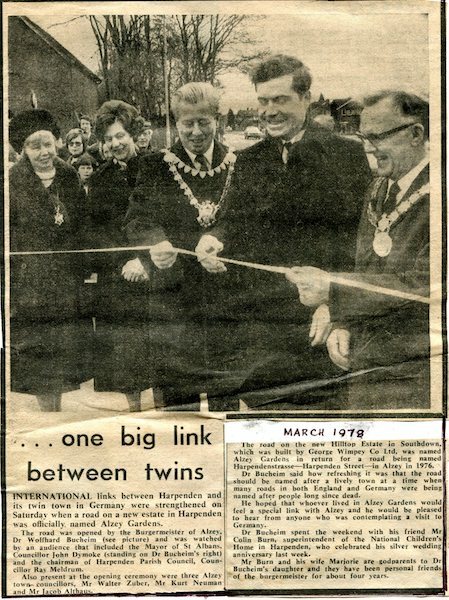 In March 1978 the Harpenden Free Press reported, under a photo of the Buergermeister of Alzey cutting the tape. International links between Harpenden and its twin town in Germany were strengthened on Saturday when a road on a new estate in Harpenden was officially named Alzey Gardens. 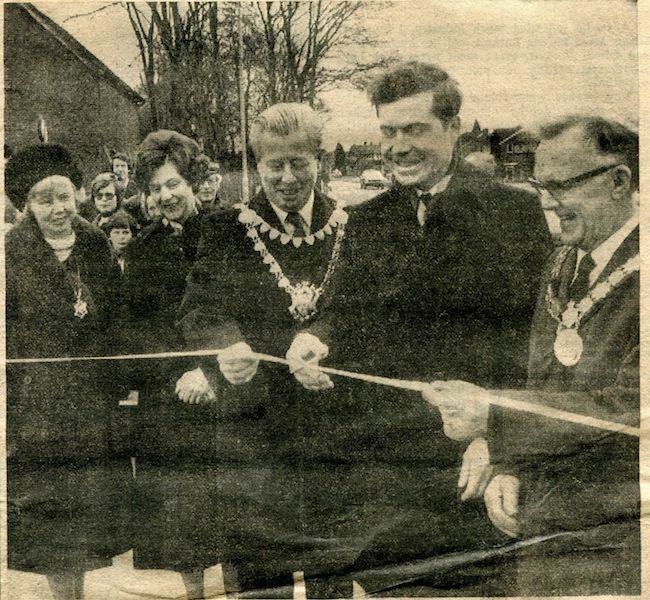 The road was opened by the Bürgermeister of Alzey Dr Wolfhard Buchheim and was watched by an audience that included the Mayor of St Albans, Councillor John Dymoke, and the Chairman of Harpenden Parish Council, Councillor Ray Meldrum. Also present at the opening ceremony were three Alzey councillors, Mr Walter Zuber, Mr Kurt Neumann and Mr Jacob Althaus. The road on the new Hilltop Estate in Southdown, which was built by George Wimpey Co Ltd, was named Alzey Gardens in return for a road being named Harpendenstrasse - Harpenden Street - in Alzey in 1976. Dr Buchheim said how refreshing it was that the road should be named after a lively town at a time when many roads in both England and Germany were being named after people long since dead. He hoped that whoever lived in Alzey Gardens would feel a special link with Alzey and he would be pleased to hear from anyone who was contemplating a visit to Germany. Dr Buchheim spent the weekend with his friend Mr Colin Burn, Superintendent of the National Children's Home in Harpenden, who celebrated his silver wedding anniversary last week. Mr Burn and his wife Marjorie are godparents to Dr Buchheim's daughter and they have been personal friends of the Buergermeister for about four years.